good morning! it's my turn for this week's papertrey ink design team tips post and i'm taking you on a behind-the-scenes look at my flat lay card photography. many stampers and paper crafters, whether on a design team or not, photograph their cards to share on various social media platforms - blogs, instagram, facebook, etc. the growing popularity of sharing communities, along with the ease of iphonography, has really enabled the wannabe photographer in me! after a recent thread on the papertrey Ink forum, i thought i'd share a few tips for how i approach flat lay photography, a trend that has been gaining speed in paper crafting circles lately. i began taking flat lay photos for my miniatures hobby and then for card photos on instagram specifically a few years ago, but these days it is my preferred style even for my blog. first, lets talk about props and styling. you made the card, right? so more than likely you have plenty of great things still sitting on your desk that will be perfect. no new supplies necessary! stamps, inks, paper, dies. washi tape, sequins, scissors, tools. all are perfect for styling a pretty photo. you may be thinking why use any props? interestingly enough, when there are a few other things in the picture, it helps the camera to pick up the color on the card better. i've taken photos of cards alone on my desk and then added props for a new picture only minutes later, no change in lighting, and it's amazing how different and more alive the card looks. 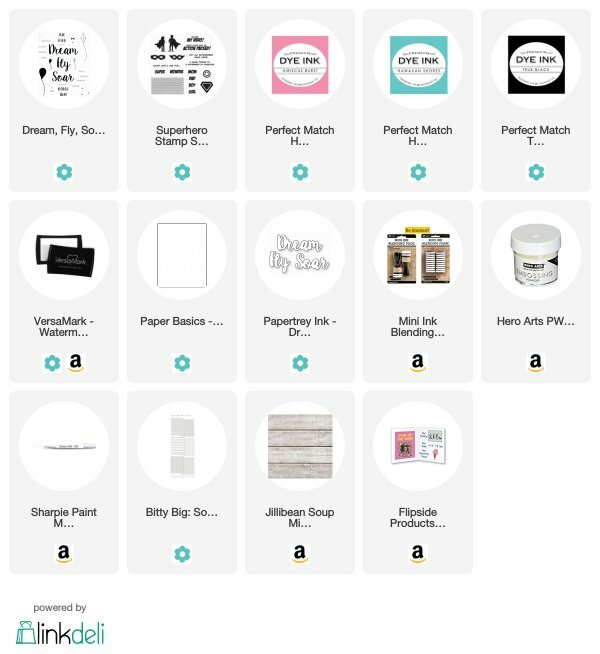 i tend to use a small mix of what i used to create the card, which i love for two reasons: 1. the supplies will coordinate perfectly with the card, and 2. they will serve as a kind of visual supply list. i also usually include a white vintage floral piece that was leftover from another project. i keep thinking i'll buy stems in a few more colors, but i like my white ones and white matches everything! backdrops, like styling props, might also be right under your nose - or feet! the first backdrops i used were the white grid paper on my desk, neutral patterned paper (like the soft stone in the supply picture above), and a white canvas board, all of which i still use from time to time. a quick walk around my house reminded me of a few other backdrops that have come in handy as well. clockwise from top left: our marble front steps, a brick walkway, an off-white distressed breakfast table, hardwood floors, a concrete walkway, and a slate floor. i've used the marble steps a lot! i tend to prefer backdrops that lean toward a white-ish gray for most of my projects. at this point, i have purchased a few backdrops like the 12 x 12 wooden plank piece pictured above (jillibean soup from amazon with extra whitewash by me), as well as a few vinyl backdrops (from ink and elm on etsy) - the white brick one came in handy for my graffiti inspired make it monday! speaking of that, i created a new card with one of the extra graffiti word art die cuts to style and photograph for today's post. above is the collection of props i decided to use in the photo: the three inks from the card plus one die and stamp, as well as my vintage flower stem. while i usually have more items to play around with at the ready as you will see in the next photo, i take care not to use too many props. you don't want to overpower the point of the photo! one of the reasons i like this wood plank piece is that i still like square photos for instagram, and since it's square, it makes setting up my picture an easy, visual task. as i lay things out, i try to tilt things in different directions and have them extend outside of the frame. this not only adds interest, it helps direct attention to the focal point, the card. you can also see that my flat lay isn't exactly "flat" - i like to prop my card up on the flowers, ink cubes and clear blocks to further call attention to it as well as reduce the possibility of shadows or weird light reflections that those objects may give because they aren't exactly flat themselves. i can also tuck things slightly under the card easily. once i have everything how i like it, i push the extras out of the way and get ready to shoot! in addition to the big window right in front of my desk i have another a little further away to the left and i use a white bi-fold foam core presentation board to reflect light toward the project from those windows, as you can see on the right-hand side of the pic. natural lighting is always best whenever possible, so it helps to know your space and your lighting. i get varying degrees of light and shadow here throughout the day and i'm often trying to race the sun to get my pictures, especially if an afternoon rainstorm blows in! you may want to take pictures at various times to get a good feel for the best time to capture the best shot. and you still may want to edit the photo a little to brighten it and bring out the true color. the photos app on iphone has some good auto color and light options, but i also like using a color story and/or snapseed. both have preset filters, as well as a full range of editing tools. the lead photo at the top is my "finished flat lay" from this shoot but i took a few extras to share some variations. above, i used the grid pad as my background along with a piece of coordinating patterned paper. because i was zooming in close, i got rid of the black ink and the stamp, adding in a bone folder to balance the die. here, i included the original graffiti word art card to show the coordination. i will often create flat lays of multiple cards that were created together to show off the whole look. in this case, i used the same stamp set and color scheme on both, so i was able to use the same props as when i photographed today's card alone. if they use different supplies, i might mix it up a bit more near each card. and finally, while i do shoot square flat lays for instagram, sometimes i want a standard 4:3 rectangle. in which case, i simply move my supplies further out, possibly adding a new prop or two. like here, i placed an extra dream die cut with the die, added in the paper from an earlier shot, and moved the white flowers to the bottom for better balance. really there is no formula or science to the art of the flat lay - it's all about playing around with your supplies and giving it a try. eventually you'll find something you like and when you repeat it, it becomes your thing! wipe off the lens before taking pics - it's amazing how often it gets smudged or dirty and cleaning it is often an instant fix! practice does make perfect - or better at least! if you have any specific questions ask them in the comments and i'll do my best to answer them as soon as i can. and remember if you share pics on instagram don't forget to #papertreyink! !